Wakefield bus station and Wakefield Westgate train station are in walking distance, with direct trains to Leeds, York, Newcastle, Sheffield, Doncaster, Birmingham, Nottingham, London, Glasgow and Edinburgh. 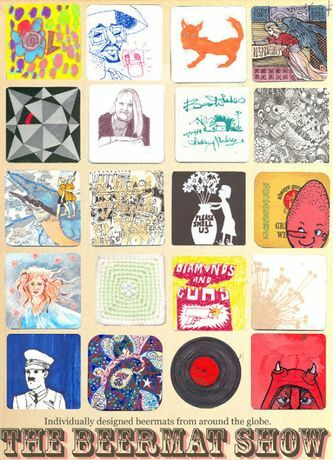 Wakefield Artwalk: Wednesday 30 January 2013, 5-9pm Studio A6, Westgate Studios, 55 Westgate, Wakefield, WF1 1BW Everyone knows that all the best ideas for anything, ever, have been jotted down on beer mats first. Always seeking to be topical rather than typical, we want to make a valuable contribution to the endless public debate about our giddy drinking culture. Here is some culture about drinking. Know your limits. It is time to celebrate all that is good about having a tipple. Add your contribution to the collection of over 1000 individually designed beermats from across the world, launched at Temporary Art Space in Halifax in 2009.